Home » SFF Reviews » Empress: So much action! 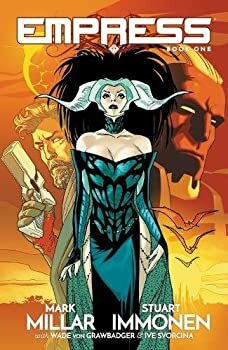 Empress is another one of Mark Millar’s big-action comics. It’s about Earth’s first rulers, long ago, when apparently they had technology beyond anything we could imagine. The Empress, Emporia, lives with a terrible husband, King Morax, who is all-powerful and likes to express that power by killing his people for the smallest possible infraction. This story is about her escape from the misery of his company as she goes on the run with her family across the galaxy. The story is fairly simple and lacks the complexity of Millar’s best work. Emporia’s bodyguard has agreed to help her escape along with her three kids, one of whom is a small baby. The action often involves monsters and other dangers, and the baby, Puck, frequently is thrown from his mother’s, brother’s, or sister’s arms as we watch what we assume will be his immediate death. At one point, he is thrown toward the mouth of a giant monster, and Dane, the bodyguard, jumps after him, grabs the baby in mid-air, and dives into the monster’s mouth, sliding down the giant tongue and eventually blasting out of the monster from the inside. This scene is typical of the crew’s close-encounters with death and their over-the-top escapes. Unfortunately, there are so many escapes at the last minute, one tires of them. This constant action also leaves little time for character development, which would have been a nice change from frantic movement in the comic. We do get a basic sense of the characters, but they remain flat and uninspired. The bodyguard has some secret past and is in love with Emporia, but we never find out what this past is. Emporia also has a secret past that is revealed only at the end of the comic. The son, Adam, is incredibly handy with technology and can build anything out of the scraps he finds on planets or after a gadget has been blown up. He’s glad to be on the run with his mother because he fears his father would have managed to kill him in the process of hardening him into a real man. The daughter, Aine, does not want to be on the run, and she is the fighter her brother is not. She thinks they should have stayed with their father. And the baby, of course, just smiles throughout the entire comic. I really wanted to like this comic book more than I did, especially since I just read about six Millar books in a row. I had high expectations, particularly after Marvel 1985, Jupiter’s Legacy, and Jupiter’s Circle, but Empress had so much action I almost became bored by it. There was a neat gadget, another character I suppose, which was a small, floating technological ball that could beam the crew to any place, or planet, that it could “see.” So, they visited some cool planets, and Stuart Immonen’s art was spectacular in showing us these locations. However, we never get to spend enough time on any one planet to get a sense of place. Still, Empress is better than many straight-action books: After all, it is a beautiful adventure book, and Millar knows how to keep readers turning the pages.